The Mongol Invasions of Japan and the Origin of the Word "Kamikaze"
In the 1270s and 1280s, the menacing forces of the Mongols attacked Japan. Through courage, determination, and good luck, the Japanese drove them off. It was an inspiration to future generations of Japanese right up to WWII. 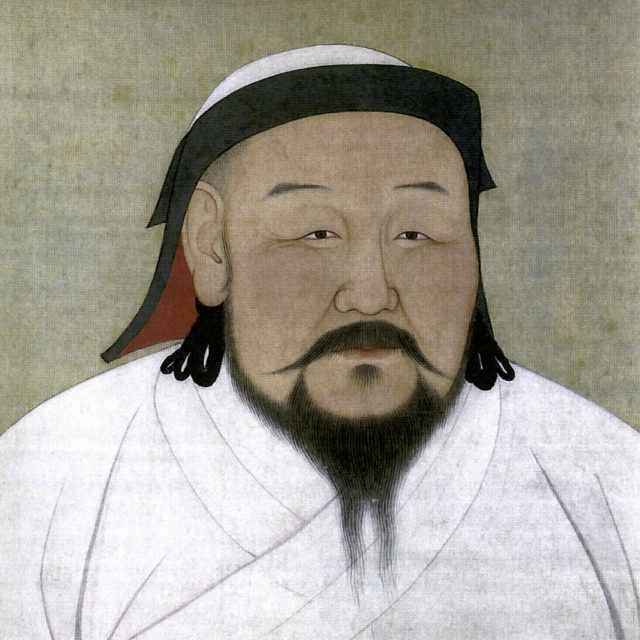 In the 1260s, the Mongols under Kublai Khan were sweeping across East Asia. Taking on the Sung Chinese, they proved to be an intimidating and unrelenting military force. Tensions between the Japanese and the Mongols did not just come from Mongol aggression. Japanese pirates also played a part. Pirates were a recurring problem in the seas around Japan. Like pirates throughout history, they showed no respect for borders that nations tried to impose. They were a mixture of Japanese, Korean, and Chinese sailors. They robbed wherever they thought they could get away with it. While Japan was struggling to keep law and order, its pirates were ignored. Officials busy with the nation’s internal problems turned a blind eye to what Japanese pirates were doing. 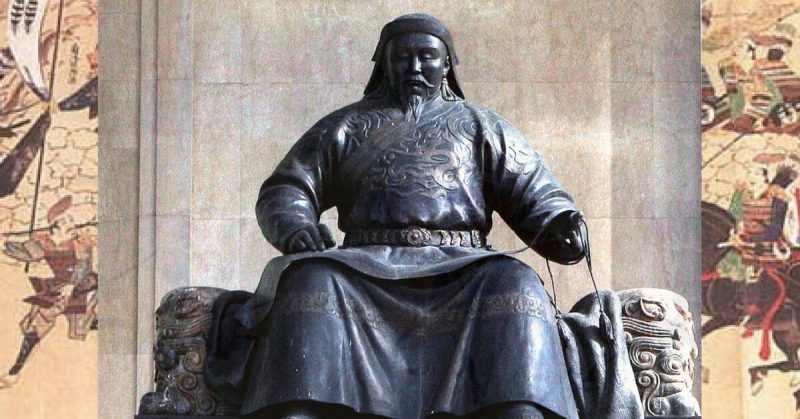 Kublai Khan contacted the Japanese asking them to deal with the pirate problem. As they failed to address the issue, his demands escalated. Japan’s ruling class was riddled with tensions. Although the emperor reigned over the country, he did not rule it. In theory that fell to the shogun, a military dictator who governed using his bakufu government. In the 1270s, there was an extra layer of authority. The Hojo Regent Tokimune was running the country in the shogun’s name. There were also tensions between noble clans. 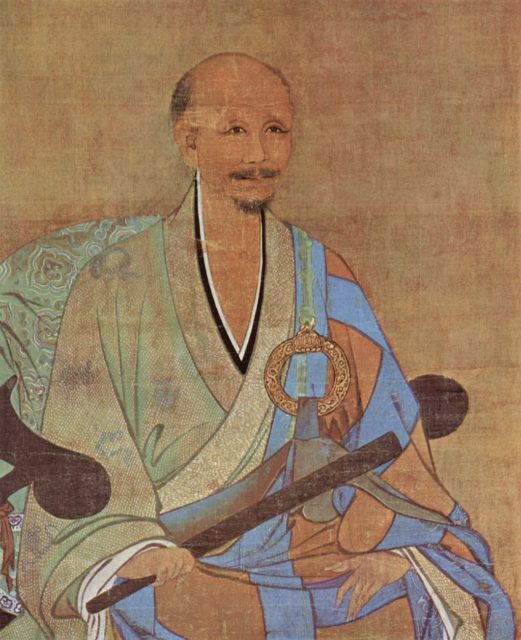 The daimyos – lords – and their samurai warriors competed for land and position within a nation whose government had shown it respected strength more than the rule of law. The Mongol assault on Japan began in 1274. By recruiting soldiers from subservient Korea, Khan vastly increased the size of his invasion force. Immense numbers of troops were crammed into hundreds of boats and they set sail for Japan. They first attacked the island of Tsushima. 200 Japanese soldiers led by So Sukekuni fought back but were overwhelmed by the weight of numbers. The same happened on the island of Ikishima, Mongol forces overcoming Japanese resistance. The invasion reached the mainland on Japan’s southern island of Kyushu. Near the site of the modern city of Hakata, the campaign began. The two nations had very different ways of fighting. Japanese warfare laid great emphasis on individual courage and skill. Leading warriors faced each other in combat. The Mongols used enormous amounts of troops, packed together in phalanxes. Swarms of arrows hurtled out of those formations, raining down on the Japanese. Fire-bombs flung from catapults accompanied them. It was not fighting as the samurai knew it. The Japanese adapted to the threat. Their fighting skills turned the war against the Mongols and their massed ranks of Chinese and Korean soldiers. The Mongols made a tactical withdrawal, returning to their boats. As they set sail, a storm came in, damaging the fleet. The invasion was over, but the threat remained. The Khan turned his attention back to the Sung Chinese. When their resistance finally collapsed in 1279, he began planning a new invasion of Japan. Meanwhile, the Japanese had been busy. Knowing the Mongols would return in force, they had built strong defenses against them, including an extensive stone wall. 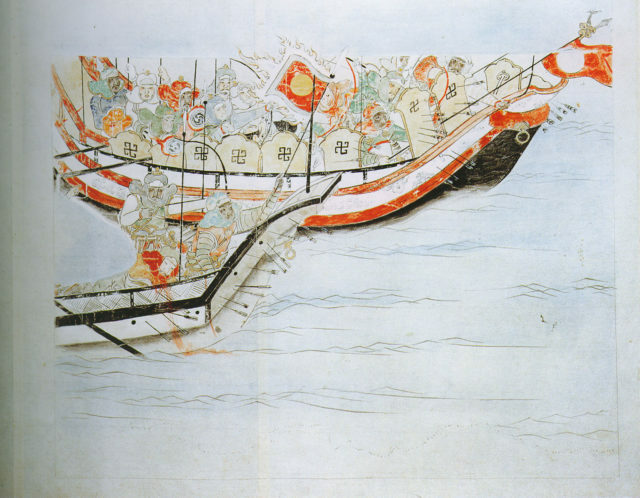 A Mongol armada set sail in 1281. It was even larger than the previous one. Better prepared than before, the Japanese harassed the fleet before it reached their coast. Night-time raids by bands of men in small ships made life difficult for the Mongols. In one dramatic encounter, 30 samurais swam to a Mongol ship, defeated the crew, cut off all their heads, and then swam away. As well as whittling away Mongol forces and morale, those raids forced the fleet to stay offshore for the sake of safety. 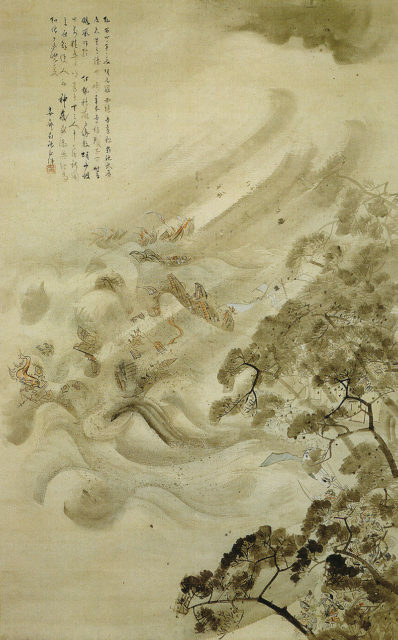 The Mongol fleet destroyed in a typhoon, ink and water on paper, by Kikuchi Yōsai, 1847. The summer sun blazed down upon the Mongols and their Chinese forces, lying in their boats off the coast of Japan. Theirs was a miserable, confined existence, not the glorious invasion they had been promised. As the end of summer approached, typhoon season came. On August 15, a terrible storm descended upon the fleet. Far more devastating than the storm that struck the previous invasion, it smashed the Mongol ships and scattered those that remained. Referred to by the Japanese as the kamikaze, meaning divine wind, it was an answer to their prayers. The invasion force had been destroyed. The Mongols would never again come close to invading Japan. The defeat of the Mongols by the kamikaze was an iconic moment. The attempted Mongol invasion and its end helped to shape Japan. Buddhist shrines associated with the divine intervention grew in prestige. Brought together by an external threat, the samurai co-operated in a way they had not done for years, bringing a period of relative unity. A legend of shared courage and resistance was born. It was what the suicide bombers of WWII thought when they took on the title of kamikaze. In their minds, they were the modern version of the divine wind, a devastating force that would answer their country’s prayers and turn back the fleet of the invaders. A 13th-century war was remembered in the 20th century, due to the divine wind.